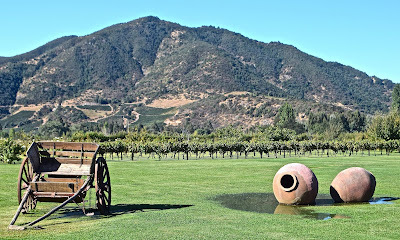 Two hours south of Santiago, as I leave the freeway, trucks with bins of grapes slow the traffic on the westbound two-lane road toward the town of Santa Cruz, in Chile’s Colchagua valley. With the warm dry March weather, it feels like September in the Napa Valley, in my home state of California. 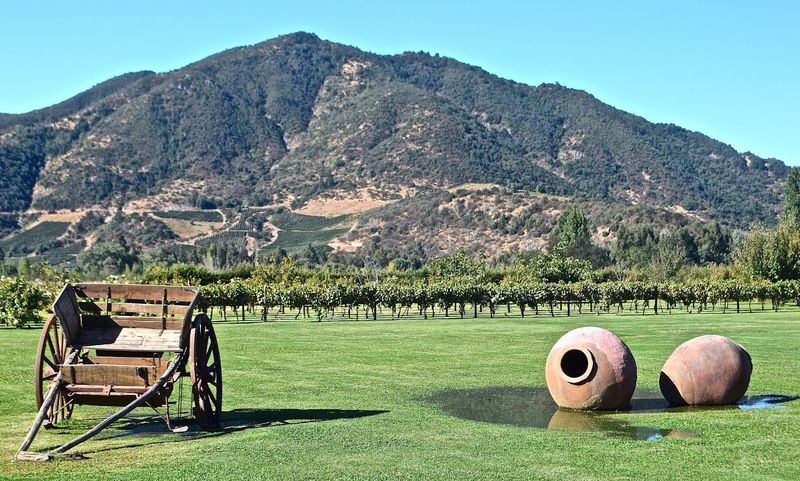 This, though, is farther than a day trip from my house, so I’ll spend several days sampling the wines and dining in the country’s premier wine district—tourist-friendly Colchagua is due to host next year’s Congreso Mundial de Enoturismo (World Wine Tourism Conference). The balconies at Hotel TerraViña have vineyard views. My first stop is the Danish-Chilean Hotel TerraViña, nearly surrounded by vineyards on the outskirts of town, where I’ve stayed on previous trips. 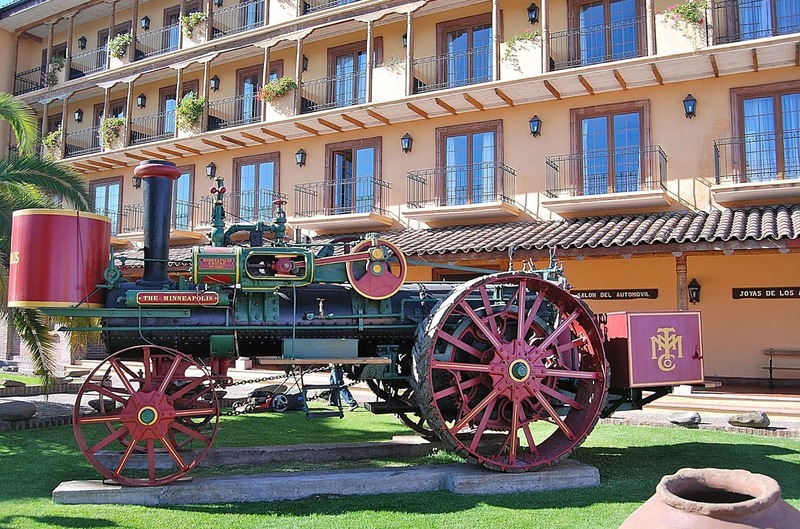 From here, it’s a short stroll through the vines to Viña Laura Hartwig, which now offers carriage rides through its grounds and new tasting facilities for an expanded wine list. 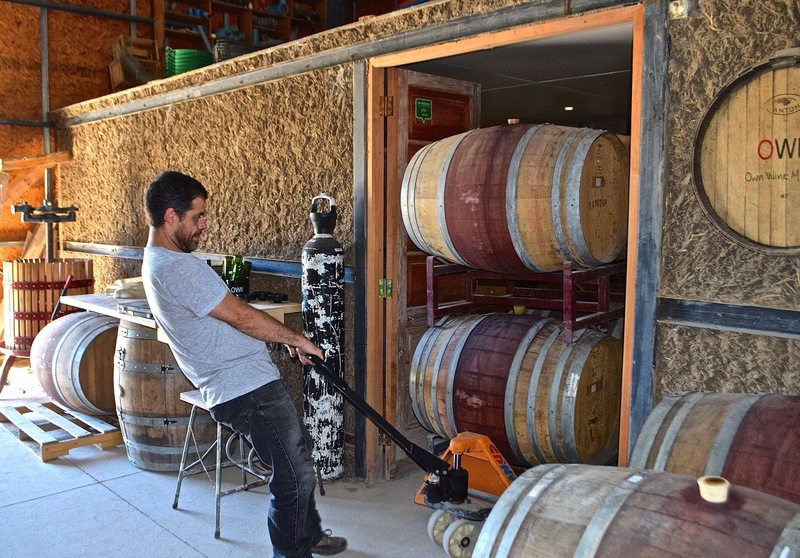 They’re part of the Movimiento de Viñateros Independientes (MOVI), an alliance of smaller wineries with an increasingly high profile. I sample a Cabernet, a Merlot and a blend, accompanied by a plate of almonds, cheese, cold cuts and crackers. The next morning, I move across town to the Hotel Casa de Campo, where the only drawback to my spacious room is its relative proximity to the highway. Fortunately, its French doors face a sprawling lawn with views of the Chilean coast range, though I’m a bit shocked to see the flood-style irrigation in an area where water's at a premium. I’m pleasantly surprised, though, when a gardener knocks on the door with a bowl of freshly picked prunes. 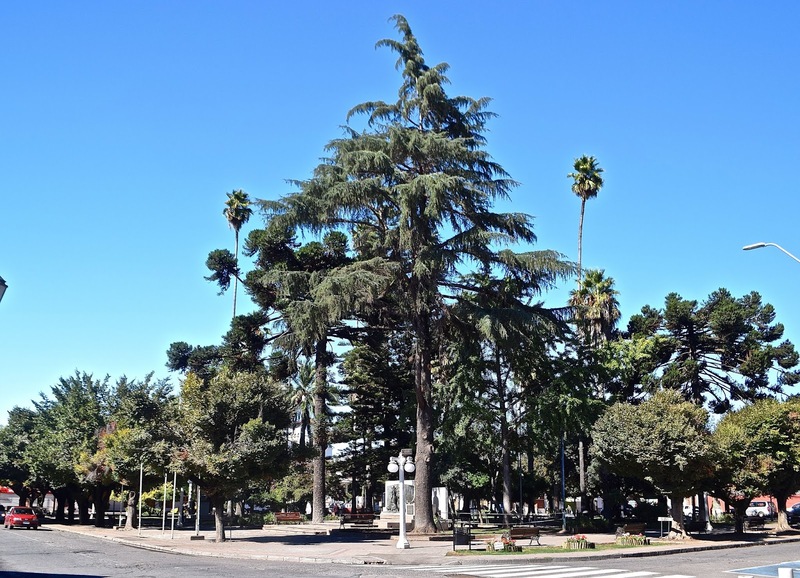 From there, I head to Santa Cruz’s walkable downtown, with a lushly landscaped Plaza de Armas surrounded by low-slung buildings and a parish church that was totally rebuilt—on its original design—after severe earthquake damage in 2010 forced its demolition. On this visit I skipped the imposing Museo Colchagua, created by Iran-Contra arms merchant Carlos Cardoen, whose foundation also financed the church’s reconstruction, but the museum’s natural history and agricultural machinery displays are well worth seeing. 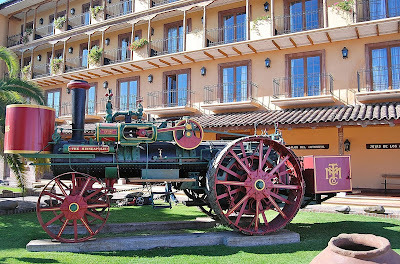 The Museo de Colchagua is part of a complex that also includes a hotel and a casino. After severe quake damage in 2010, Santa Cruz's Iglesia Parroquial underwent demolition for a total rebuild on the original plan. 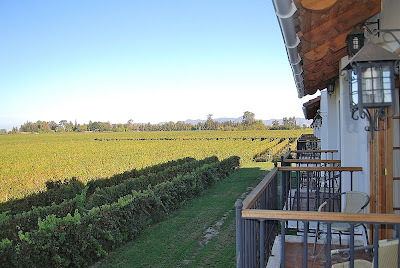 That afternoon, I eat on the patio at Casa Colchagua, a renovated adobe just a stone’s throw from TerraViña. Rather than bread, the appetizer is a sopaipilla enhanced by the savory tomato-onion-garlic salsa known as pebre. 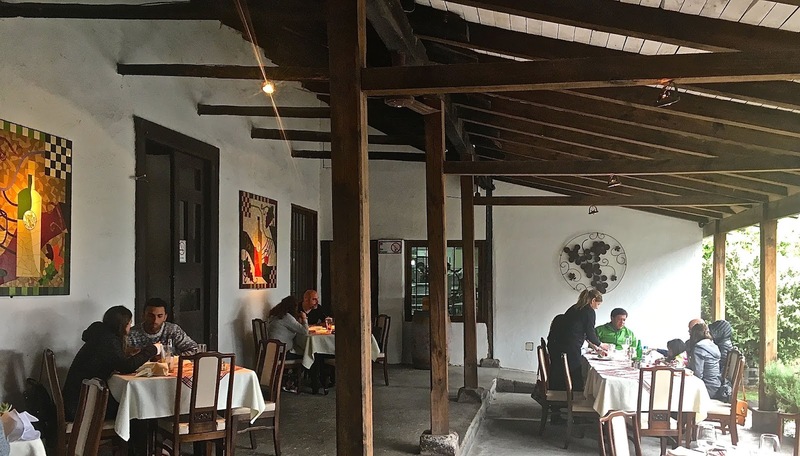 For the main course, there’s quinotto with shrimp, scallops and squid rings–Chile’s diverse seafood is world-class—plus a pisco sour with a touch of ají verde, and a nice glass of Sauvignon Blanc. 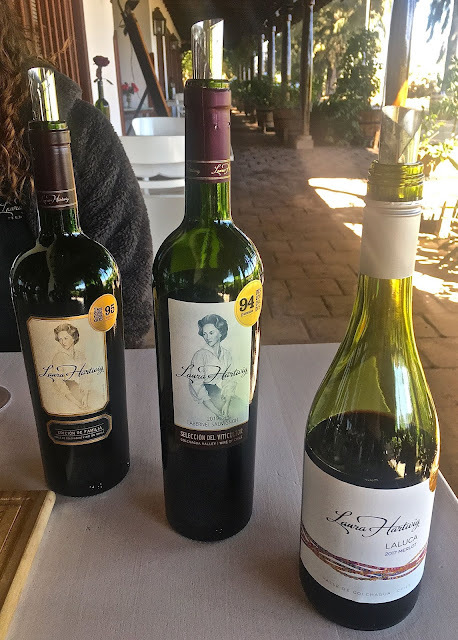 In the afternoon, I drive to the village of El Peral to visit OWM Wines, a low-tech operation that produces only blends and does much of the work manually, while bodega itself is a tiny adobe within a far larger garage full of heavy machinery. With a minimum of two guests (maximum of eight), winemaker José Antonio Bravo does the tours himself, and encourages guests to make their own blends. 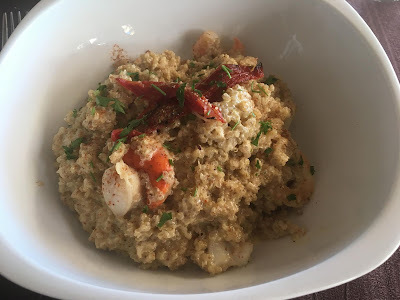 Later, back in Santa Cruz, I dine at Vino Bello—an established Italian option—for a seafood risotto. The next day, an unseasonably rainy one, I meet British photographer Matt Wilson and his wife Andrea—a winemaker at Clos Apalta—for dinner at their house near the Viu Manent winery (whose wines are most readily available in California). We chat about travel writing, photography and the madness of Brexit, among other topics, and enjoy several glasses of Apalta’s wines (Apalta is not a MOVI member). 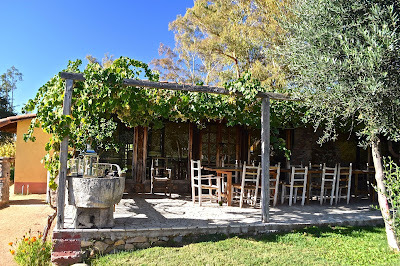 The next morning, I moved to the westerly site of Clos Santa Ana, where Italian winemaker, art collector and dog fancier Luiz Allegretti invites me to a long Sunday lunch with his neighbors—one of whom is also a winemaker—and to spend the night in his sprawling colonial home, with its multiple interior patios. That’s a privilege, but Allegretti also has a tasting room for the general public. 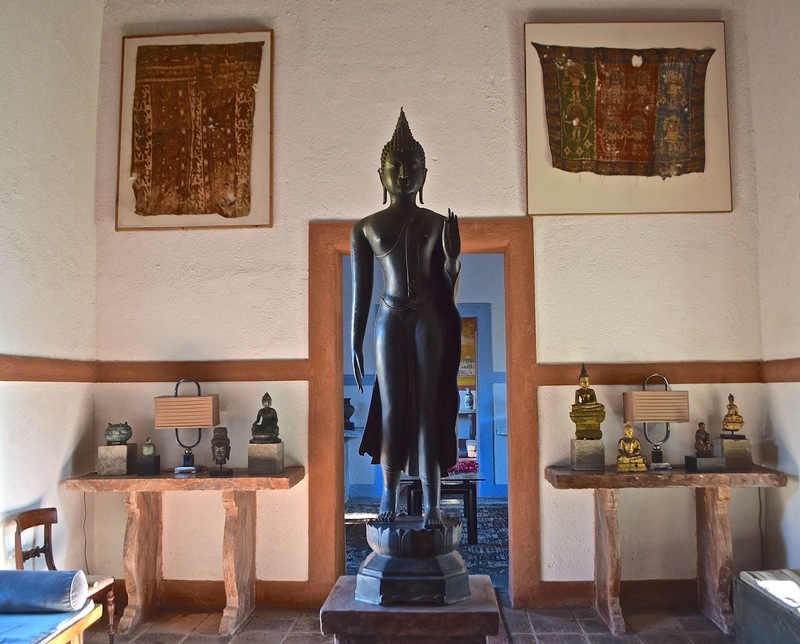 At Clos Santa Ana, Luiz Allegretti has an eclectic art collection. 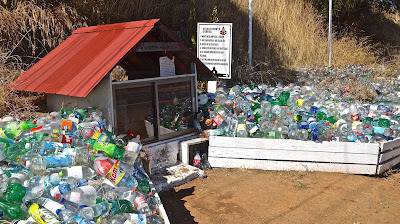 On the road to Pichilemu, there's a shrine to the Argentine folk saint Difunta Correa. 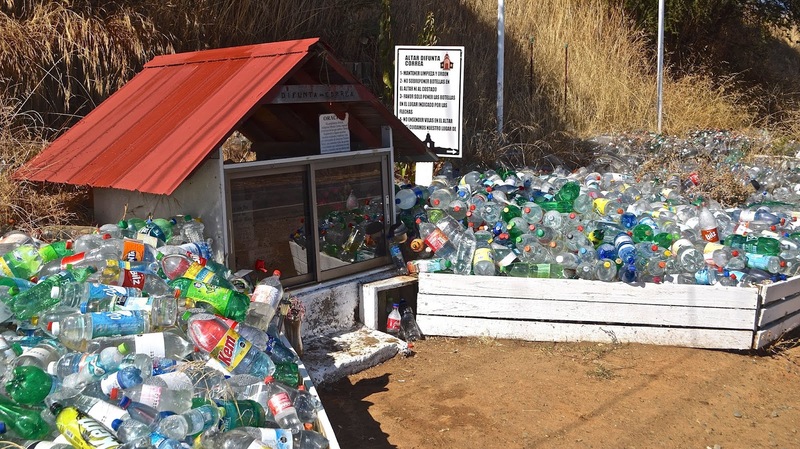 The next morning, I drive west through the coast range toward the beach town of Pichilemu, passing a large roadside shrine to the Difunta Correa (do Argentine surfers leave bottles of water for San Juan’s legendary folk saint?). Once an exclusive playground for the rich—its renovated cultural center is a Francophile structure built by the Anglo-Chilean Agustín Ross Edwards, whose name also graces the handsome waterfront park. 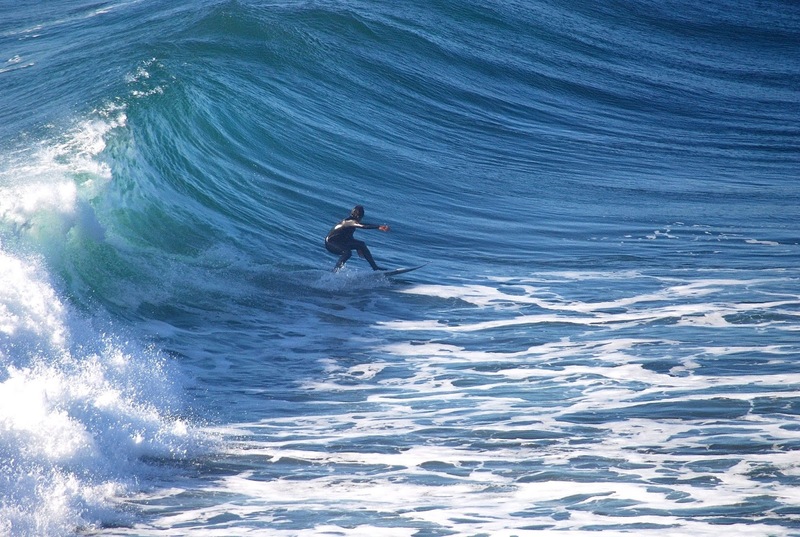 The downtown’s seeing signs of rejuvenation, but much of the action has moved south to Punta de Lobos, which attracts a cosmopolitan surf crowd comparable to what comes to northern California during the famous Mavericks competition. Sacred to surfers, the point of the peninsula here is now a protected reserve under the aegis of the Fundación Punta de Lobos. 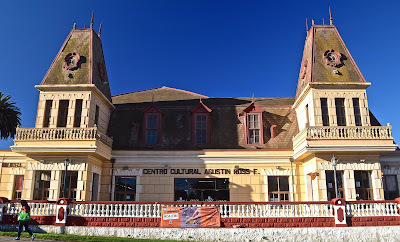 Pichilemu's Centro Cultural Agustín Ross was originally a casino. 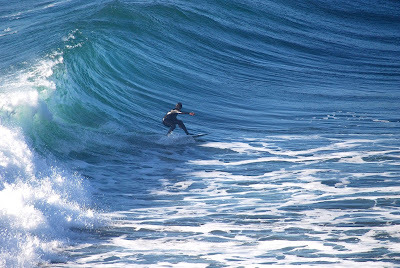 Pichilemu's Punta de Lobos is sacred to surfers. There, the budget crowd stays at La Sirena Insolente, the newest member of a small hostel chain that has comfy private rooms as well as dorms. 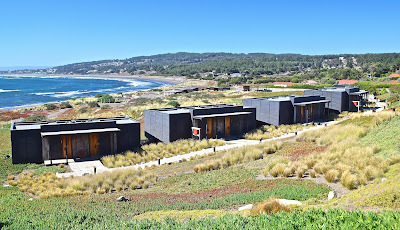 At the other end, I stay at the luxury surf lodge Hotel Alaia, at a spacious room with ocean views and a private deck, not to mention its skateboard park, climbing wall, beach bar, a freshwater pool, and surfing lessons. 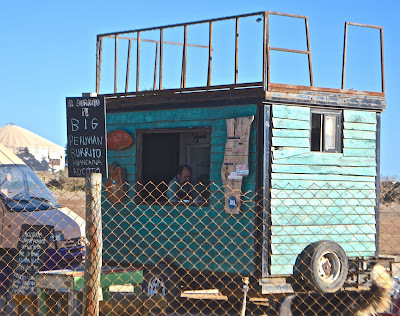 I don’t ride the waves—at Punta de Lobos there are small monuments to surfers who died here—but I dine its stylish restaurant—primarily using locally sourced ingredients. 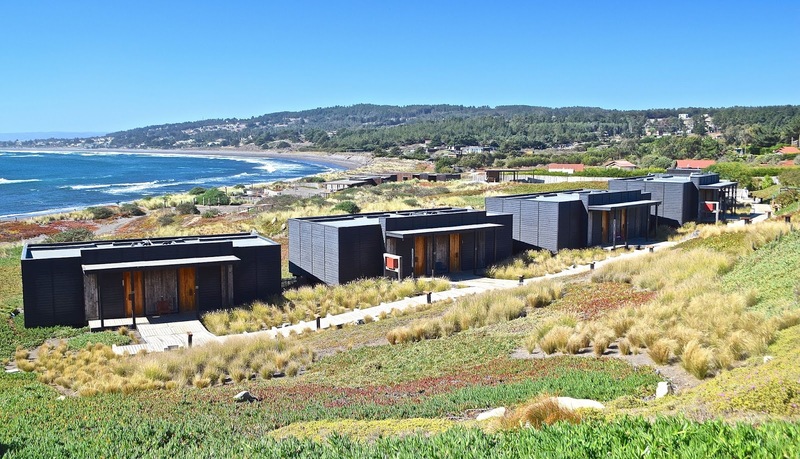 At Hotel Alaia, all the rooms have easy beach access. At Punta de Lobos, I also find a cluster of food trucks offering some unexpected treats such as a Peruvian burrito—perhaps the ultimate in fusion cuisine? 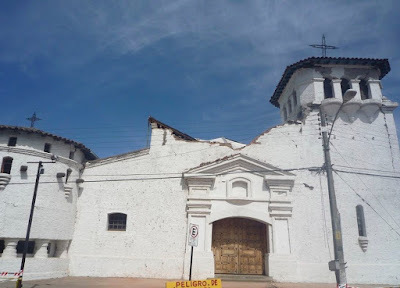 Unfortunately, when I arrive around noon the following day, the Peruvian’s hasn't yet opened, and I need to return to Santiago. That tantalizing burrito will have to wait. When I first saw the Peruvian burrito trailer, I'd already had lunch.